The Maine Outdoorsman: Anyone Else Wishing for Spring? 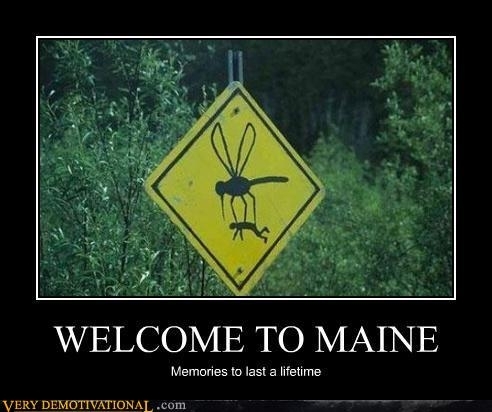 You know it has been a long cold, snow filled winter season, when you see a poster like this and your mind swings to sweet thoughts of warmer weather, spring mud season, DEET and you simply can't wait to start swatting at the swarming hordes of blackflies and mosquitoes. Ahhhh, only a few more months! I need that sign for my shop! The little blood suckers are already out in full force here. My Themacell is fully loaded and ready for next weekend's turkey opener. That sign is a little concerning. There's nothing better than standing streamside next to a nice pool trying to cast... into.... that.... exact... spot... with your eyes squinted up and lips curled inward to keep the bugs out and sure enough, one goes right up your nose. 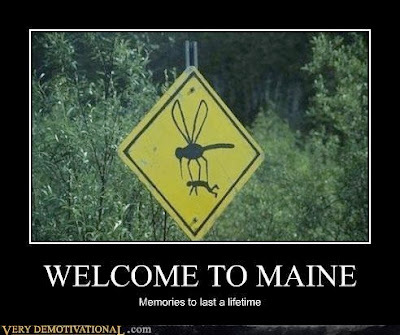 I can't wait to start putting DEET in my coffee again! Buddy, it's not so bad down here. Winter relented early, for once. We still have a chill in the air most mornings and I'm sure 3 months of rain coming up. But it's not frozen and snowing.